Service Fabric is a distributed systems platform that helps you build, deploy and manage microservices in any public cloud or on-premises. The platform powers mission critical services within Microsoft and external workloads running both Windows and Linux. To enable the provisioning of Ubuntu clusters in any environment, today we are announcing the Service Fabric provider for Bosh, an open source project that makes deploying and operating distributed systems easy. Bosh is an open source technology that makes the deploying and operating distributed systems easy. With roots from the Cloud Foundry ecosystem, the technology is used to operate many large-scale mission critical workloads. The diagram below illustrates at a high level how Bosh works. The operator interacts with a Bosh director by providing the infrastructure and software (Service Fabric) configuration. The Bosh director then handles the communication with any IaaS provider and the deployment of Service Fabric. 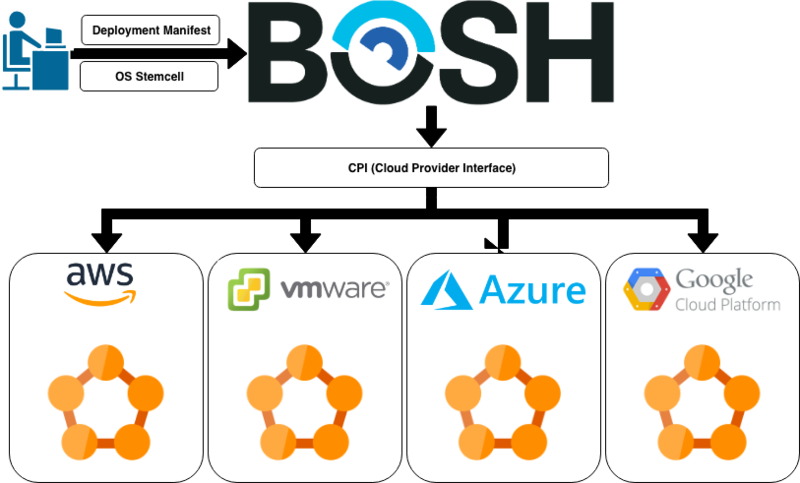 The Service Fabric provider for Bosh allows you to deploy and manage Service Fabric Ubuntu clusters in any of the public clouds and on-premise using a single deployment model. Bosh handles the deployment of the cluster based on a configuration against any environment. In addition, once the cluster is deployed, failure of the underlying components of the cluster: virtual machines & disks are gracefully resurrected and reintroduced to the Service Fabric cluster by Bosh. By combining the capabilities of Service Fabric and Bosh, upgrades to the operating system, security patches and the Service Fabric runtime can be performed with zero downtime. Service Fabric and Bosh are both open source projects on GitHub and therefore, the Service Fabric Bosh release is completely open sourced on GitHub. Any updates to Service Fabric release for Bosh will be available on the repository. Additionally, all support related tickets can be reported in the GitHub repository under the issues tab. Contributions to the repository including bug fix and feature requests are more than welcome!